Take a look a this free map of Laos here. Download the map to your PC, tablet or smartphone with iOS, Android or Windows. Or use it on your website. This free tourist map of Laos shows important places in Laos. There are not only natural places - mountains, seas or rivers, but political borders and important cities as well. There are some special marks for selected interesting places which you should consider when planning your holidays (subject to availability - eg. the best beaches, monuments, trekking, attractions). In Laos there are much more of such places, of course and we are preparing more free maps which can provide more detailed information for your travel. Right now we recommend to visit for example these interesting places in Laos: There are many nice places in Laos, let's start with the mountains in Northern Laos with good opportunities to hike. South part of the country is flat and relaxed - but what do these two regions have in common? They both have the Mekong river, meandering among the mountains in the north and flowing lazily in the south, where Si Phan Don is a good base for visiting this region. If you are looking for some cultural attractions, you should not miss the capital of Laos,Vientiane, with many nice buildings, like the Temple of the Emerald Buddha, Pha That Luang and Wat Si Muang and with the Buddha Park. Then there is the Luang Prabang city, which is on the UNESCO list and offers places like Haw Kham, the former royal palace, Wat Sen and Vipassana Temple. Not far from here are the Kuang Si Falls and the Pak Ou Caves (Buddha caves). And consider visiting the Plain of Jars with megalithic archaeological excavations from the Iron Age and Champasak city with some impressive Wats.These are just selected interesting places in Laos. There are much more sights and things to do, for example off the beaten tracks, off the main tourist trails. Some more information you can find on other maps here. >>> How to use this map of Laos: Most of the maps can be enlarged using the button Full size. If you want to download this free map of Laos to your PC, smartphone or tablet with Android OS, iOS, Windows or Linux, press the Download button. And to get a link to this page with the map press the button Link to. Some more information is below the map. Icons for the best beaches, trips, monuments, treks and other places of interest located on the map are only approximate. This map of Laos as a free download is designed for cell phones or tablets with all systems, including Android, iOS, Windows, Blackberry, Tizen, Firefox OS, or Symbian or for laptops with Windows, Mac OS, Chrome OS or Linux, but you can use it on your website as well. Why we offer this map as an image - the bitmap? Because you can use it off-line. Because you can make marks and notes to the map, just use a convenient graphical editor. And because it does not take up much space. Please note, however, that because this map of Laos is available for free as an image - the bitmap - it can not of course be used with GPS. For use with GPS geolocation we recommend to use an appropriate application with custom maps. For Android and Apple iOS there is an OsmAnd applications available which offers the option to download offline maps. 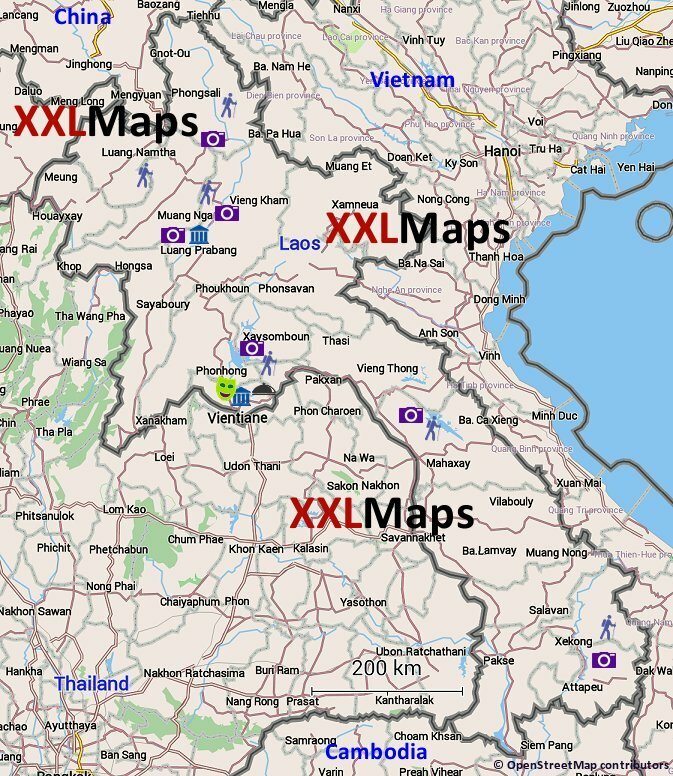 This map of Laos, as well as other maps here on XXLMaps, can also be used on your website, in your printed materials and so on. If you want to use more than 5 maps from XXLMaps on one web domain or in one material, or want to edit the maps, please contact us. Otherwise, just download any map to your site, insert it as an image, and put beneath it an active link to the page on XXLMaps where the original map is located. When used in print always mention the source XXLMaps. In all maps with the exception of maps of continents and the world must also be maintained in the readable form this information about the underlying data source: © OpenStreetMap contributors. Another data used in the maps come from public domain sources such as CIA Factbook, unless otherwise stated at the map (if it is, then you need to indicate such source also).